Please visit Suite 101 for Veteran's information, etc. As a member of the Michigan Agent Orange Commission since 1988 (officially, January 1990), and the MAOC chairman for over five years... I have collected a huge amount information on herbicides (AO/dioxin)... heard too many grim and sad stories about the ill effects about herbicide (AO/dioxin) exposure... attended too many funerals, and have contended with various idiots (and liars) who say that herbicides (Agent Orange and the other agents) are not harmful. My conclusion... it must have been the toilet paper! My involvement in the AO/dioxin issue is not argumentative, rather, educational. The more information available in a language that everyone can understand (not just for scientists), the better off we are. Therefore, any intelligent person can make up their own mind regarding the hazardous effects of these toxic chemicals. 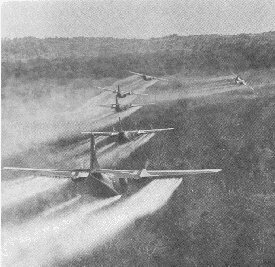 Please understand that dioxin (TCDD) is still present (as a contaminant) in many products sold in stores today... although not in the concentration of the herbicides used during the Vietnam War. However, continued exposure to these chemicals (and similar ones) increase your "toxic" body burden. From a personal view, I firmly believe that we will all stand before God one day. He will judge righteously. The liars and cheats will no longer be able to misrepresent, or deny the truth... that dioxin is, perhaps, the most deadly chemical that man concocted. I sincerely regret that we may have to wait that long for true justice. Note: Governor John Engler signed an Executive Order (No. 1997-4) to abolish the Michigan Agent Orange Commission in March 1997. This is not necessarily a bad thing. However, the manner in which this was done does not set well with veterans. The AO and the POW/MIA issues linger for most Vietnam era veterans. These "links" are presented to educate. If you wish to help with this education process, please feel free to distribute this information. If you have doubts as to the detrimental effects of various herbicides used during the Vietnam War, you are encouraged to contact the survivors of cancers... widows of husbands who witnessed a lingering and often painful death... along with the children deprived of many things that we, as veterans, believed in... freedom, liberty, justice, the pursuit of happiness... our American dream. Austrialian Vietnam Veteran (Gary McMahon) It's his reflection on Agent Orange, PTSD, etc.